Bahia offers a Military Discount to property owners who are serving because we believe that they deserve the best property management service at the best rate while they’re away on duty. Service members deserve the best property management service at the best rate while they’re away on duty. Our Full Property Management service is offered at the rate of 8% to you if you are in service. Going through a Permanent Change of Station (PCS) order can be difficult especially if you have a family and have to change your home so suddenly. 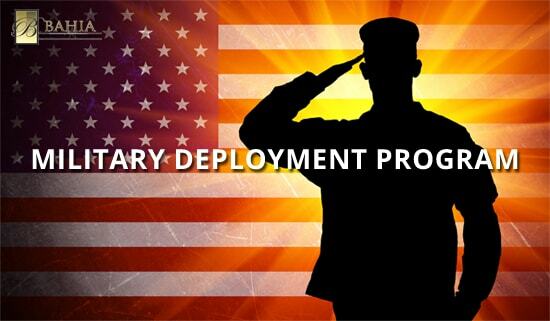 We understand the sense of urgency and we try to minimize your stress as much as possible through this process so we’re proud to offer the Military Deployment Program to the property owners who are in service. When you receive a PCS order you have to make sure you rent your current home and we are experts at getting in there and taking over the process. We take care of everything. For your benefit, we will list your home on AHRN so the military community is aware of the process. We advertise your home in about 50 real estate websites and search to cooperate with over 200 realtors via Multiple Listing Service (MLS). All of this is part of our property management service and there are no extra fees or hidden costs so you can count with us. It is very important for us that you know that we are fully aware that your property is more than just an investment – it’s your home. We will rent your homes while you’re away and then make sure is well take care of when you return. Bahia Property Management counts with a maintenance department considered one of the best in the industry with great reviews of our quality services. We have a 24/7 emergency line to respond to urgent situations such as flooding or electrical issues.